I love to thrift on vacation. I like to visit new stores and generally check out the culture. It does take a bit of planning to make sure you're not wasting a moment of your holiday. I've included tips for success plus my finds from a trip to Las Vegas. I went on a short excursion to Las Vegas and came back with a pretty great thrift haul! I was there three days and managed to squeeze in a day at a thrift store trifecta in Henderson, NV. Savers, Goodwill, and Salvation Army are all short distance from each other. Plan your route before leaving by searching Google, thethriftshopper.com or asking the locals on Twitter like I did! Pack a bigger bag so that you have room for extras. Don't forget you can always ship them home separately which may be more cost effective than paying for extra bags on an airline. I saw so much good stuff. I had to do a lot of weeding as I like to pack light and stick with carry on luggage plus I had gifts for Violet from my mother. The packing was quite intense. Anticipate a solo excursion. Sadly, not everyone enjoys the thrift enough to do it on vacation. Let your travel buddies know ahead of time so it doesn't get weird when you slip away. You will likely not be coming back to the store even if they have a return policy so inspect finds thoroughly. Same as thrifting when at home, it's a good idea to leave everything packed in a separate bag until properly cleaned. I tie my find up in the bag they came in until I'm ready to wash them. I flew back to Chicago with 2 jackets, 2 dresses, a coverup, a tunic, 2 pair of pants, a bracelet and 2 pairs of shoes for a grand total of $55. Not to shabby considering one of my items retails for $400+! I found a J. Crew short trench and a fun shawl collar jacket in Goodwill. 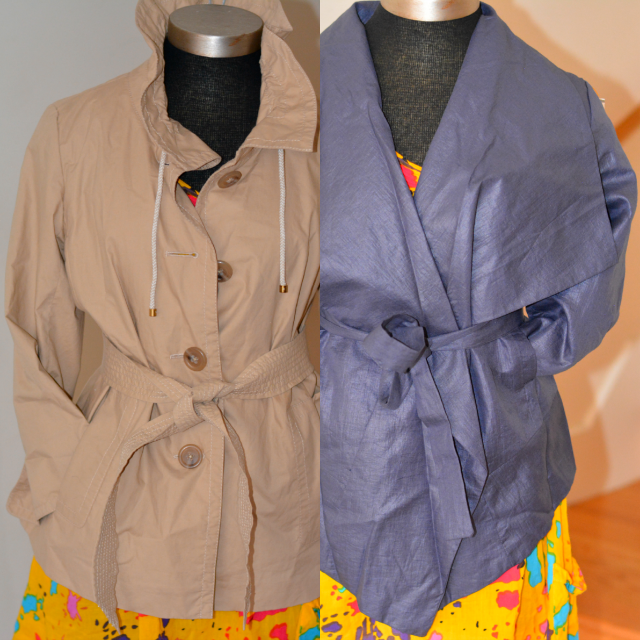 The trench fits my arms and the shawl collar has short sleeves. Both are were winners for that alone. They're light enough to wear as a cover up when I'm in a rare sleeveless top kind of mood. I believe the yellow lace dress is a swim suit coverup. I want it to be a dress therefore I will make it happen. I tried it on backwards thinking it would be a cool tunic top. Didn't quite work. Still thinking. Suggestions please! The striped shirtdress has side elastic that gives some shape to what is basically an oversized button up. 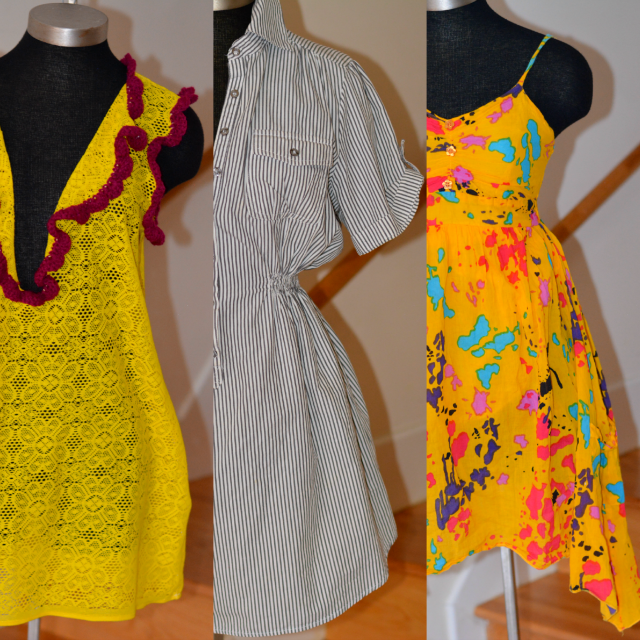 A style that normally puffs me out.The yellow print dress has a lovely pattern so I decided to snag it even though the bewb area is too small for me. It will likely end up in The Thriftanista Closet. This little tunic has a lot of personality. The gold accents on the shoulders are a nice touch. Pants with high waists and tapered just to my liking. 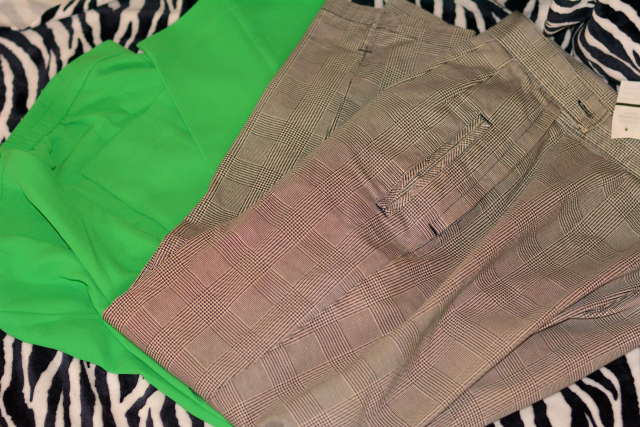 The lime green ones have a touch of elastic too. The bracelet looks like it may be a cast off from Charming Charlie. I had the pleasure of visiting for the first time during this trip. I'd heard of them from other blogs but had no idea how amazing it is until I stepped in and saw all the pretty colors. I sure did leave with a little something from the actual store too. The Tod's mules are a teeny tiny size 5 and I bought them specifically to sell. Tod's retail $400 - $800! I did find flats for myself. 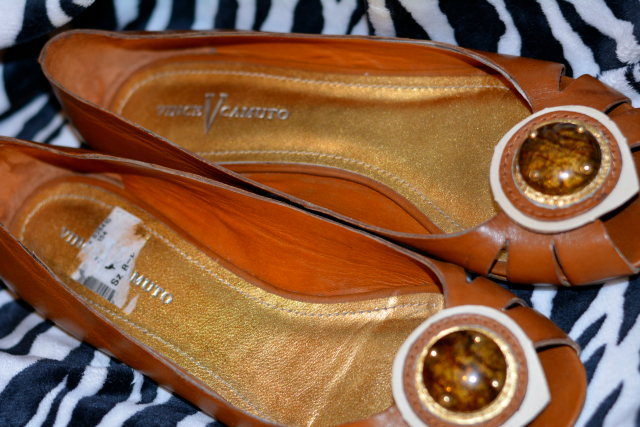 Very comfortable Vince Camuto open toe shoes with cutouts and a snazzy accent jewel on top. The day after I returned, I took a quick trip to my local Village Discount Outlet as they were having a 50% off sale. I was in and out in under 30 minutes. 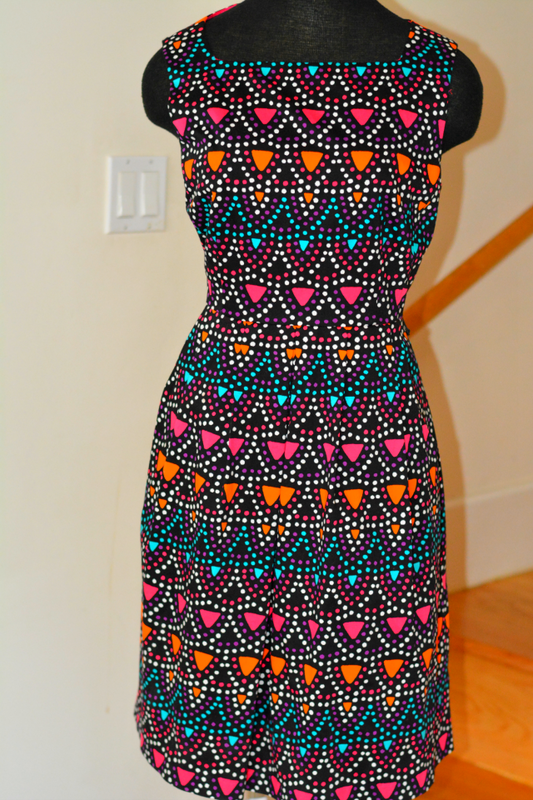 On the way out, I spotted this lovely Nanette Lepore dress. I was able to find a buyer for it the same day. I have mixed feeling about selling but without selling, I could not afford to buy. It will pay for my entire haul with a little bit left over. 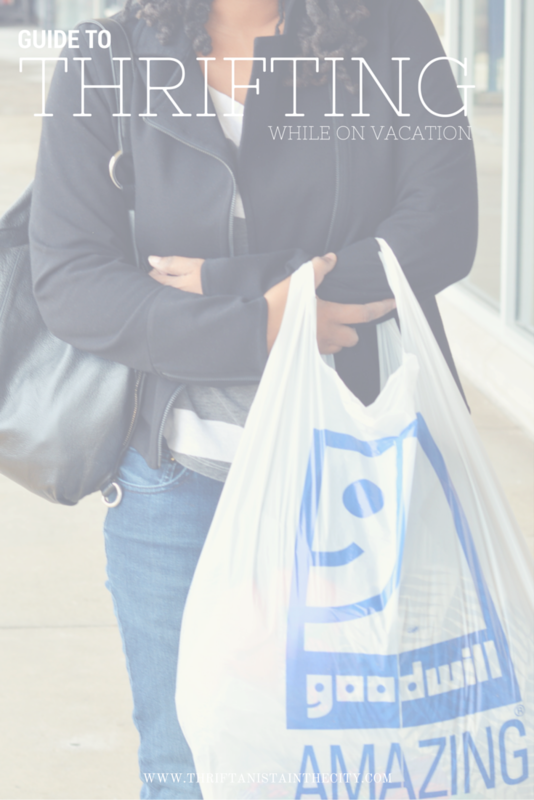 Do you thrift on vacation? I love the open toe flats you snagged. 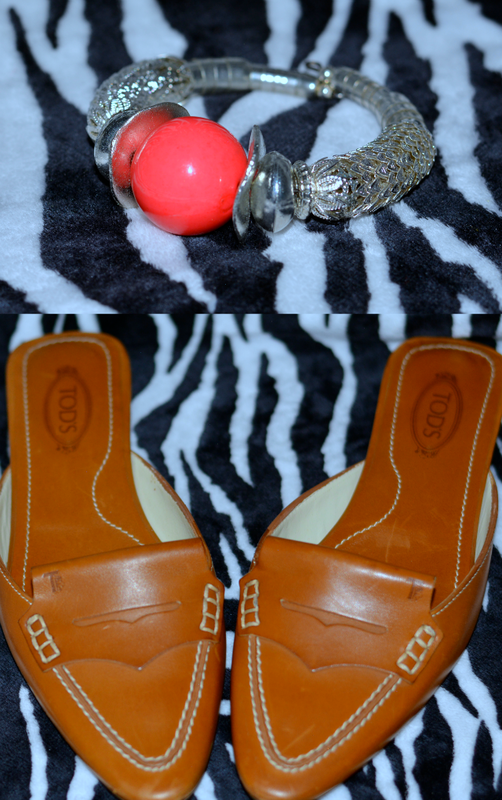 It's my favorite style of flat for summer! And now I'm searching ebay for "Nanette Lepore dress". Curious as to how the prices and selection compared to Chicago area thrift stores?